As Church Action on Poverty reflects on how best to share our vision of a Good Society, we’ve had discussions with many others in the church who are thinking along similar lines. In this guest blog, theologian and activist Jo Chamberlain shares some of her thinking. People do like to talk about “returning to British values” or to “Christian values”! But they are less clear precisely what those values actually are. And if we could agree on the values we think are Christian, would those values be the ones we would like to see in a good society? I’d like to think that a society based on Christian values would be a good one! I recently completed a dissertation based on some research about values. You can read more about this research on the Common Cause website. It suggests that values based on intrinsic motivations are generally associated with behaviour that promotes the common good rather than just individual gain. This is in contrast to values which rely on extrinsic rewards, which make people less likely to act for the common good. 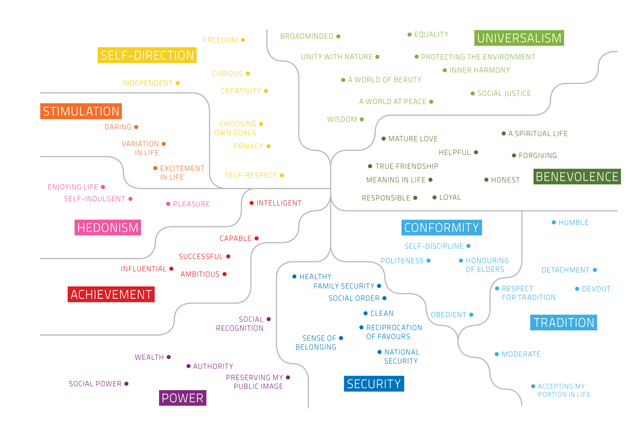 This set me wondering – are the values which promote the common good the same as Christian values? And what are these values? The research sorts the values into groups (see below), and two groups in particular are associated with behaviour which benefits others (pro-social behaviour such as buying fairtrade products, action to mitigate climate change, concern about inequality). One group, labelled Benevolence, is particularly linked to behaviour which helps family and friends. This includes values of mature love, forgiving, meaning in life, true friendship, a spiritual life, helpful, honest, responsible and loyal. I think it is uncontroversial to say that these are Christian values. But the group of values most strongly associated with pro-social behaviour is the one labelled Universalism. This includes social justice, equality, a world at peace, broadminded, unity with nature, a world of beauty, wisdom, inner harmony, and protecting the environment. And the opposite group (Power), most strongly associated with stopping people engage in pro-social behaviour, includes social recognition, preserving my public image, wealth, social power, and authority. This is where I am challenged. The values in the Universalism group do not seem to be obviously Christian. Do I reject them as nice but not central to the Christian faith, even though promoting them is likely to bring about the biggest changes for the benefit of all? Or is my view of Christian values too small? It was the Beatitudes (Matthew 5:3-12) which convinced me. A radical manifesto to challenge the structural injustice in society. This short passage turns the Power values on their head, and instead of placing importance on wealth, status and power, Jesus says that the poor, the meek and the persecuted are blessed. Also blessed are those who stand with the poor in spirit, who hunger for righteousness and justice, who seek to bring peace and whose motivation is pure – values of equality, social justice, a world at peace and inner harmony. I don’t think the Beatitudes are an exhaustive account of Christian values, but they are a representative one. Within them we find that the values within Universalism are Christian values. There are a few gaps, most notably those concerned with the environment, which may be why it has taken the church so long to wake up to its environmental responsibility. But most stark is the comprehensive rejection in the Beatitudes of Power values. It is in the not seeking after power, wealth and status that Christianity finds itself most at odds with the world we live in. A good society cares for everyone and works for the interest of the common good. It considers its impact on all, not just those in its immediate neighbourhood. I think a society displaying the intrinsic values identified by Common Cause is most likely to become a good society, values which we can also identify as Christian values. We can find these values in a gospel which tells us to love our neighbour, to speak out for justice and righteousness, and to reject the self-serving interests of status and power. Read more from Jo Chamberlain on her blog, Act Justly Love Mercy Walk Humbly. This entry was posted in Churches, Good Society, Partners and allies by Church Action on Poverty. Bookmark the permalink.